Did ME2 Attorney Fischman disclose real Interested Parties? In the Texas Federal District Court (as of 2017), I am working on defense research for five (5) copyright infringement / bittorrent “John Doe” lawsuits affiliated with the Guardaley / Carl Crowell. In a ME2 case, ME2’s local counsel Gary Fischman was ordered by Judge Keith P. Ellison to disclose “all interested parties” to the lawsuit, and this is the subject of this article. and, the Siemens PLM v. Does 1-100 software piracy case and multiple Malibu Media, LLC cases (both outside the scope of this article). WHY IS IT IMPORTANT TO KNOW WHO HAS A FINANCIAL INTEREST IN A COPYRIGHT INFRINGEMENT LAWSUIT? The reason it is important to know who has a financial interest in these lawsuits is because I need to know 1) whether the corporate entity that is suing has the authority to sue, and 2) whether the corporate entity filing the lawsuit is the same entity that holds the copyright to the movie allegedly infringed in the lawsuit. If the corporate entity (here, ME2 Productions, Inc.) does not have the authority to sue, or if it is not the true copyright holder (but some entity that licensed the rights to make money for the copyright holder based on the copyright rights granted to the true copyright holder to the “Mechanic:Ressurection” movie), the plaintiff might lose the lawsuit or even get sanctioned for not disclosing the true parties who are interested in the outcome of the lawsuit by alleging in a document like this one (link) that they had the right to sue when in fact they did not. WHY AM I SUSPECT THAT MAYBE THE PARTY SUING MIGHT NOT HAVE COPYRIGHT RIGHTS TO SUE? The only way a plaintiff can sue for STATUTORY DAMAGES OF $150,000 FOR COPYRIGHT INFRINGEMENT is if they have a valid copyright to the movie title allegedly being infringed (or, downloaded using bittorrent or Popcorn Time). If they do not own the copyright but only the right to monetize, the plaintiff may only be entitled to ACTUAL DAMAGES, NOT STATUTORY DAMAGES. In a bittorrent “John Doe” lawsuit, the actual damages are really the cost to purchase a copy of the infringed movie (~$30 for the DVD), or perhaps $8 for the movie ticket if the movie is still in theaters. The law only gives STATUTORY DAMAGES OF $150,000 to plaintiffs who have a valid copyright at the time of the lawsuit. So here is why I am suspect that maybe ME2 Productions, Inc. might not be the holder of a valid copyright: We know from the Dallas Buyers Club, LLC lawsuits (when the real Dallas Buyers Club copyright holder sued Voltage Pictures, Inc. for not paying settlement moneys owed to them) that there was an entity (Voltage Pictures) that purchased the rights to monetize Dallas Buyer’s Club’s intellectual property (the right to use the Dallas Buyer’s Club name, the right to sue, etc.) Voltage then turned around and set up an entity called “Dallas Buyers Club, LLC” and sued hundreds of John Doe Defendants using that name. Little did we know at the time that the Dallas Buyer’s Club plaintiff was not the Dallas Buyer’s Club copyright holder, and the copyright troll plaintiff entity was merely masquerading as the Dallas Buyers Club copyright holder. WHY ARE THE DALLAS BUYERS CLUB LAWSUITS RELEVANT TO ME2 PRODUCTIONS CASES? The common thread behind the Dallas Buyer’s Club lawsuits and most copyright infringement lawsuits filed today is a german company called Guardaley (a.k.a. IPP). It is not relevant that Guardaley’s bittorrent tracking methods have been ruled not credible by the German courts; they have been wreaking havoc on US courts since 2012. Guardaley (as far as I understand) has been behind the scenes of each and every ‘copyright troll’ lawsuit filed in the federal courts. And, after April 2016, they have reportedly signed an agreement with Carl Crowell (a known copyright troll attorney, but more importantly, likely the mastermind behind each of the ‘copyright troll’ lawsuits filed by local attorneys across the US). 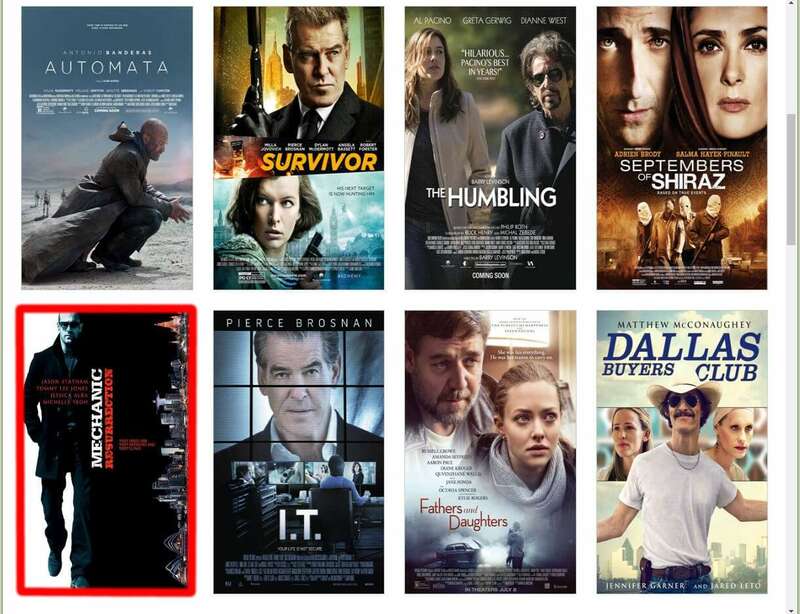 Screenshot from Carl Crowell’s RIGHTSENFORCEMENT.com website, with Mechanic:Resurrection outlined. Thus, naturally, I am suspect to each of ME2 Productions, Inc.’s other lawsuits in other states, here, Texas, because as the apparent puppetmaster behind the various ME2 Productions, Inc. lawsuits filed across the US, I must assume he has a financial interest in the outcome of this Texas lawsuit filed by Gary Fischman. WHO DID ATTORNEY FISCHMAN SAY HAS A FINANCIAL INTEREST IN THE ME2 BITTORRENT LAWSUITS? ME2 Productions, Inc. might be the actual copyright owner, or it is possible that they are an entity that was set up for the purpose of monetizing the copyright rights granted to the actual copyright holder, the owner of the Mechanic:Resurrection movie. A&T IP, Inc. is an enigma to me. I do not know who they are, where they are incorporated, and who the beneficiaries are of this entity. 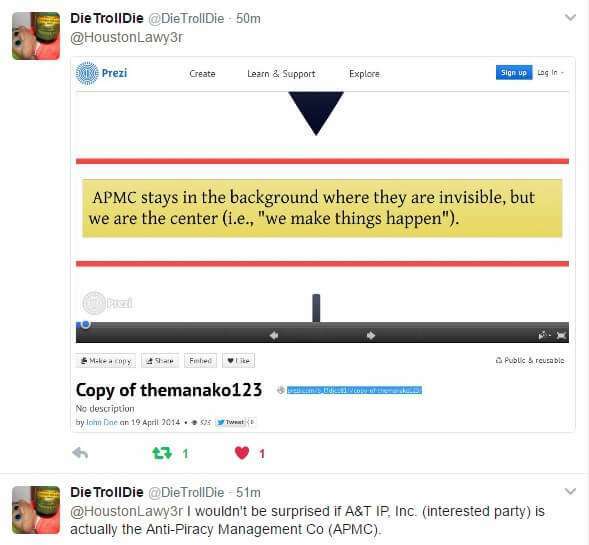 UPDATE: DieTrollDie suggests that perhaps A&T IP, Inc. is actually the Anti-Piracy Management Co (APMC). DieTrollDie suspects that A&T IP, Inc. is really the Anti-Piracy Management Co. (APMC). Fischman Law, PLLC is curious in and of itself for reasons outside the scope of this article. Naturally, it could be explained that Gary Fischman as the attorney suing on behalf of ME2 will benefit (e.g., commissions from settlements received, possibly fees from the copyright holder or the Crowell / Guardaley entity itself for time spent prosecuting these cases). However, I suspect the link goes slightly deeper, as his partner for a number of the Guardaley lawsuits, Joshua Wyde, listed himself as a witness in the lawsuit (something that is generally not done). So there may be more to the eye here, but not relevant to this article. Looking at all of this information together, I am left with the following questions. WHERE IS GUARDALEY (IPP) AS AN INTERESTED PARTY IN THIS CASE? WHY IS CARL CROWELL NOT LISTED AS AN INTERESTED PARTY IN THIS CASE, OR IS HE [AND GUARDALEY] SOMEHOW WRAPPED UP IN THAT “A&T IP, INC” ENTITY? IS ME2 PRODUCTIONS, INC. THE SAME LEGAL ENTITY THAT OWNS THE COPYRIGHT TO THE MECHANIC:RESURRECTION MOVIE, OR ARE THEY SOME OTHER ENTITY THAT IS MERELY MASQUERADING AS THE ME2 PRODUCTIONS / COPYRIGHT HOLDER UNDER SOME LICENSE TO MONETIZE THEIR COPYRIGHT RIGHTS? Your thoughts and feedback are obviously welcome. DISCLAIMER: In this article I speak a lot about plaintiff attorneys cheating their own copyright holder clients, billing them “by the hour” (rather than the conventional method of accepting the copyright holder clients “on contingency”), and in some cases, wasting time to generate additional billing to their own clients. It is my observation and opinion that this is happening, but short of a lawsuit like we saw with the Dallas Buyers Club copyright holders against their Voltage Pictures licensee, it is difficult to prove that such things are taking place. However, “honor or dishonor among thieves” is not the topic or the point of the article — the point of the article is that plaintiffs are dragging defendants further into the federal lawsuits by naming and serving them, and it is my opinion that it is still possible to obtain a settlement, even after a client has admitted guilt in an answer to a deposition question. It is a sad day when trolls force those they’ve accused to become legal experts and to stick their toes into the federal courts to defend themselves. In the attached article, DTD is correct that lawyers (myself included) can get expensive, and defending a case (e.g., answering a complaint, showing up and defending a deposition, answering the various requests for information that are required in a federal lawsuit, etc.) is often more expensive than simply paying a copyright troll plaintiff a few bucks to make them go away. Unfortunately (at least in my Texas Southern District federal court), the copyright-troll attorneys appear to be billing their copyright-holder clients BY THE HOUR (which differs from the old model of a plaintiff attorney agreeing to take a case on contingency and only sharing in the settlement profits believing [the lie] that “they’ll make millions going after John Doe Defendants”), so these ‘hardened’ plaintiff attorneys seem to be running-up the bill by dragging the defendants through the mud — naming them, serving them, filing documents, and wasting everyone’s time. In short, while I agree that IN NORMAL CIRCUMSTANCES doing what DTD suggested (filing an answer with the court and fighting your case) would normally not be something one would ever dare do [at least without a lawyer holding his/her hand, or sitting in and defending a deposition], in today’s evolution of the bittorrent cases, filing an answer and at least being willing to endure the legal process until a settlement is offered (and a settlement is usually offered eventually) has become a necessity. Let’s take a quick example. In the typical scenario, the goal in representing a client who wants to settle is to contact the plaintiff attorney on the client’s behalf and negotiate a settlement. For a plaintiff attorney who is billing his copyright troll client by the hour (as is what appears to be happening in the Texas bittorrent-based copyright infringement cases), agreeing to a settlement is too easy of an outcome because the plaintiff attorney does not make the kind of money he could make “dragging the defendant through the mud while charging his client hourly to do so.” (Remember, as we saw with the Voltage / Dallas Buyers Club cases, a crooked attorney steals not only from his victim [the accused defendant], but also from his client (as we saw in the Voltage / Dallas Buyers Club cases where Voltage was sued for failing to pay Dallas Buyers Club monies earned and owed to it through its copyright enforcement activities)). More likely than not, the plaintiff attorney’s client (the actual copyright holder seeking to “monetize” or “enforce” the rights given to him via his copyright) is not aware that the attorney is over-billing (e.g., engaging in such “mud-dragging”, “revenue-producing” activities often cannot be proven, and thus it continues until the copyright holder gets tired of paying his attorney’s bill). Thus, free of scrutiny from his client, the plaintiff attorney needlessly exacerbates the situation by demanding from the defendant something unreasonable (e.g., that unless the defendant is willing to agree to sign an explicit admission of guilt prior to being made aware of the kind or amount of settlement he will be offered, there will be no settlement). [FYI, this is something no sane person would agree to.] As a result, the defendant refuses to admit guilt, he gets named and served, and he is forced to spend thousands of dollars more to defend himself. Why? Because his plaintiff attorney figured out a way to milk not only him (the defendant), but his copyright-holder client as well. There are a number of steps that happen after being named and served, but the point is that eventually, the plaintiff attorney is going to schedule a deposition (where the defendant will need to answer questions “under oath,”) and the defendant is going to tell the truth about what happened. If the download indeed happened, this will come out in the deposition. However, this “nightmare” fear that the defendant will “admit guilt” will only cause one result — the plaintiff will have proof that at trial, based on the information elicited from the defendant in the deposition, that defendant could be held liable for the $150,000 in statutory damages. But then… how many of these defendants have $150K sitting around in their mattresses or in their bank accounts? And if they do, don’t you think that instead of paying the judgment, they would rather hire a bankruptcy lawyer and file for a bankruptcy to discharge the copyright infringement judgment in bankruptcy? In short, the worst-case-scenario in a deposition is that the defendant admits guilt, which is often what will likely happen if the defendant is the downloader of the copyrighted film. But then after all this excitement, the plaintiff attorney and the copyright holder still want to get paid (and they know they are likely not going to collect anything by obtaining a $150K judgment against the defendant). This is why the plaintiff attorney will likely initiate settlement talks with the defendant, taking his financial circumstances into consideration. This is not to say that settling a case right away (and before being named and served) is no longer an option — there are multiple copyright holders filing in the Texas and New York courts, including Criminal Productions Inc., September Productions Inc., CELL Film Holdings LLC, the infamous Malibu Media LLC, Fathers & Daughters Nevada LLC, Dallas Buyers Club LLC, and the related non-bittorrent copyright holders which include DISH Network L.L.C. (not so much anymore) and Siemens Product Lifecycle Management Software, Inc. (a software company), each of whom have their priorities and specific instructions on how they would like their plaintiff attorneys to handle the lawsuits on their behalf. But, what I do want you to glean from this commentary (really, it’s an article, but I did re-blog DTD’s article and I need to stick to that topic), is that plaintiff attorneys ARE naming and serving defendants, and it should be expected that this could happen — and if a defendant is named and served, they could still negotiate a settlement. But be aware that in order to get to that point, the plaintiff attorney (who might be motivated by maximizing his billing to his own client [think, stealing from you AND stealing from his own client]) might drag you through a deposition and a number of steps before he accepts a settlement from you. I agree that lawyers are expensive simply because we charge for the time it takes to complete each step of the legal process. However, many attorneys (myself included) already know how much time each step will take, so “flat fee” billing is an option (understanding that billing would happen based on timelines of where you are in the lawsuit). BLOCK 1: FROM GETTING NOTICE OF THE LAWSUIT THROUGH BEING NAMED AND SERVED [WITH THE INTENT OF NEGOTIATING A SETTLEMENT PRIOR TO BEING NAMED AND SERVED]. BLOCK 2: FROM BEING NAMED AND SERVED (E.G., FILING AN ANSWER WITH THE COURT, PROVIDING ANY NEEDED DISCLOSURES, FILING ANY PROTECTIVE ORDERS, SETTING DISCOVERY TIMELINES). BLOCK 3: FILING INTERROGATORIES AND REQUESTS FOR PRODUCTION, AND ANSWERING INTERROGATORIES AND/OR REQUESTS FOR PRODUCTION. BLOCK 4: PREPARING FOR AND DEFENDING A DEPOSITION. …AND SO ON, BLOCK 6: …TRIAL (my opinion, unlikely, unless the copyright holder figured out a way to prevent the deep-pocket defendant from filing for bankruptcy). I have laid these out as a template, as each case and each copyright holder often needs to be handled differently. Typically, clients were able to negotiate a settlement and be released from liability with just BLOCK 1. However, as we discussed above, we are seeing more-and-more that plaintiff attorneys are taking defendants deeper into the lawsuits (“deeper down the rabbit hole, so to speak”), specifically past the “naming and serving” stage, past the answer stage, and into the discovery stages before considering or accepting settlements. I am not one to advocate doing this on your own, and if you could afford an attorney (me, or anyone else), that is the safest way to go. But if hiring me or another attorney is not an option, fighting this on your own (called, “pro se”) is the best alternative, and DTD’s article gives you a good first and necessary step in getting the ball rolling. As I said before, good article, DTD!